Designed by the architect Meinhard von Gerkan, the station was built on the former ground of the Lehrter Bahnhof and put in operation on May 28th, 2006 as Berlin Central Station. With the head office of Italy’s leading financial journal ‘Il sole 24 ore’, a building complex with more than 1,200 office and conference rooms and a surface area of 48,000 m² arose. The building of the ‘Landesbank Baden-Württemberg LBBW’ with a surface area of 58,000 m² is located 300 meters away from the central station of Stuttgart, Germany. The most important goal was to create a comfortable room climate for the employees and at the same time keep the operating costs low. For the largest-ever cruise ship 'Oasis of the Seas', LOYTEC’s L-IP Redundant CEA-709/IP router was chosen to set up an IP-852 (Ethernet/IP) channel as a backbone for high speed communication. After a two-year construction period in the center of the upper-Bavarian Danube city the head office of the Sparkasse Ingolstadt was inaugurated. The building automation system is based on infrastructure components from LOYTEC. For HVAC and streetlight control at the International Horticultural Exposition 2006, located in Shenyang, China, LOYTEC tools and infrastructure components were used. The 'ESPRIT Arena Düsseldorf' is one of the most modern multi-purpose stadiums in Europe. The Wangjing International Commercial Center, approximately 120,000 square meters, is located in the famous Wangjing area, which is the largest modern residential area of Beijing, China. The China Reinsurance office building is near the famous Financial Street in Beijing, China. The building automation system is designed to use LOYTEC components. 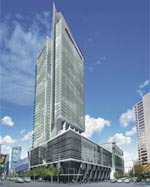 New high-rise Ernst & Young Center in Sydney, Australia comprises the main tower of 44 levels offering minimum A grade quality accommodation. The building benefits from a central core with full height double glazed windows, allowing excellent natural light and views from the upper levels to all elevations. 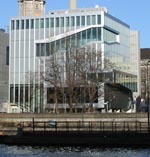 New building of Royal Netherlands Embassy in Berlin, Germany. 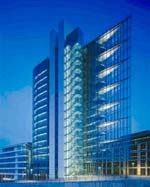 New office building for the headquarters of CHG-Meridian, Deutsche Computer Leasing AG, in Weingarten. The new office tower of Dresdner Bank in Frankfurt has 38 floors and offers approximately 30,000 square meters of office space. In the heart of Frankfurt's banking area, in Junghofstraße, a sophisticated office building called Junghof Plaza with eight upper floors and an office area of approximately 35,000 m2 has been constructed. One of the most complex CEA-709 installations in Europe was realized in the new building of the KfW (Kreditanstalt für Wiederaufbau) Frankfurt by the ARGE KfW-MSR. In the course of renovating the hospital in Rohrbach, Austria, CEA-709 was implemented as the building control system. The Central Park is a new industrial park near Sossenheim, Germany. Three of the buildings there have been automated using LOYTEC components for the network infrastructure. The City Tower and the adjacent Kubus are equipped with cutting edge building technology. The network infrastructure is made up of devices by LOYTEC. The shopping center in the old city hall is the new hot spot of Innsbruck. Seven cafes, bars, and restaurants cater for visitors and invite them to stay. The building automation of the newly reorganized and extended federal school center in Wörgl was implemented with LOYTEC devices. The network infrastructure of the retirement community Wörgl is built up out of network infrastructure components from LOYTEC. Jaarbeurs Utrecht is the place to meet in the Netherlands. Whether it is for a short meeting, a congress of several days, a trade fair, or any other event, Jaarbeurs Utrecht offers the appropriate facilities and services. The 'Landesmesse Stuttgart' is a state-of-the-art showground with architectural and functional convincing buildings. A widely ramified CEA-709 network takes care of lighting and shading.